We love iced tea. Most of it we brew from really fine tea leaves, so flavorful that we don’t even add sugar. You can eliminate the sugar from this home-brewed blackberry iced tea recipe, and allow people to select their own level of sweetness and their sweetener of choice: agave, honey, noncaloric sweetener, sugar or nothing at all. 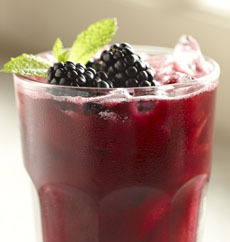 If you have a windfall of blackberries, you can make blackberry ice cubes to serve with the drink. Fill ice cube trays with water as usual, and drop a blackberry and a mint leaf into each section. You can make the recipe caffeine-free with herbal mint tea bags. You can also use the blackberry purée in lemonade. Prep time for the blackberry iced tea is 15 minutes plus chilling. The recipe is courtesy of Driscoll’s, the country’s leading berry distributor. 1. PLACE tea bags and mint in a heat-proof pitcher. Add boiling water. Steep at least 10 minutes. 2. STRAIN into another pitcher and discard the mint and tea bags. Stir in sugar. 3. PURÉE the blackberries in a blender or food processor; strain through a fine sieve. Discard pulp and seeds. Stir the blackberry purée into the tea. Taste and adjust sugar as desired. Chill. 4. SERVE over ice garnished with a mint leaf and 2 blackberries (use cocktail picks if you have them).